If fans of History’s Vikings haven’t figured it out yet, Ivar the Boneless always has a plan. So does Alex Høgh Andersen, the Danish actor who plays him. 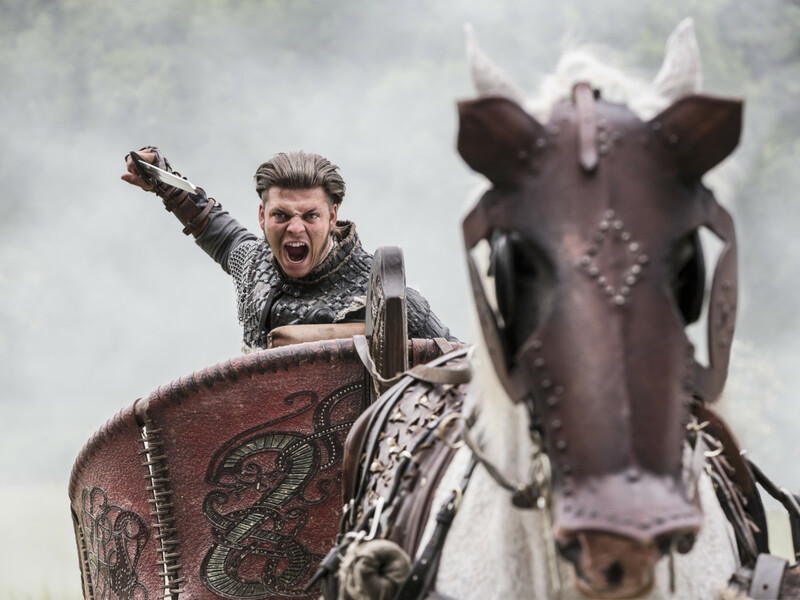 Ivar puts his latest plot in motion in an episode titled “The Plan” that airs at 9/8c Dec. 13. In the sneak peek below, we see Hvitserk (Marco Ilsø) trying to get his younger brother to explain why he’s pretending to burn the bodies of dead Vikings as they hole up in York after taking the Saxon town. Ivar, still angry that Hvitserk and Ubbe (Jordan Patrick Smith) went behind his back to attempt a peace deal with King Aethelwulf (Moe Dunford) in the Dec. 6 episode, isn’t eager to let his brother in on the secret. “And you will know, my brother, in good time,” he teases. If you follow what Andersen has said about his character, Ivar probably isn’t just angry, but also feeling hurt, betrayed and alone. Like most of the characters he writes, series creator Michael Hirst gives Ivar a lot of layers for Andersen to explore. While Ivar comes off as a rather horrible person—he did kill his own brother after all—Andersen sees someone who is “very broken on the inside.” He brings that vulnerability to the surface occasionally to show that at least some of the angry, maniacal Ivar is just an act. Viewers witnessed one of those “crazy scenes” during the Dec. 6 episode when Ivar was knocked from his chariot—did the Vikings call them chariots?—and, covered in blood, began wildly taunting the Saxons. Jonathan Rhys Meyers brings an intensity to Heahmund that is equal to Anderson’s take on Ivar. Meyers and Hirst have given the warrior bishop an almost maniacal zealotry as well. Heahmund and Ivar will come face-to-face in future episodes. Despite being on extremely opposite ends of the fight, Anderson said, they do find some common ground—even if it is unspoken. Despite his upcoming battles with Heahmund (wait until the Dec. 20 episode folks! ), Ivar likely hasn’t forgotten about his desire to avenge the murder of his mother, Aslaug. Lagertha (Katheryn Winnick) sits pretty high atop his hit list. And then there’s that running feud with his surviving brothers. His murder of Sigurd (David Lindström) sparked much more than a sibling rivalry. “He knows that the killing of his own brother created a wound between him and his brothers that I don’t think he will be able to ever heal again,” Anderson said. Last week, Ubbe finally split with Ivar because he believes that as the oldest sibling, he should lead the Great Heathen Army. He sailed away while Hvitserk stayed with his younger brother. As the teaser below suggests, Hvitserk still might be in the dog house as far as Ivar’s concerned. Anderson presented the Ivar-Ubbe rivalry as yet another dynamic in the series that allows him to show Ivar’s often hidden emotions. He and Smith discussed the brother’s relationship, deciding that Ubbe was most concerned in the past with filling the void when their father, Ragnar (Travis Fimmel), disappeared for so many years. As their big brother, Ubbe felt responsible for taking care of his little brothers—especially Ivar. Sounds like history might repeat itself in the world of “Vikings” with another battle of brothers. Ragnar and his brother, Rollo (Clive Standen), fought each other for years. Ivar likely won’t be able to forgive Ubbe or Lagertha, and will no doubt sail to Kattegat to attack get his revenge. Whether he’s a monster or a sad, lonely “poor boy,” it just isn’t in his nature. And Andersen is just fine with that. Calling it a challenge to make Ivar sympathetic to viewers, Andersen said he’s never had trouble feeling empathy for his character.